Even into 2019, the Google Pixel 3 has the best smartphone camera you can buy. Don't let its raw specs fool you: its very ordinary sounding 12.2MP rear camera with a single lens and an f/1.8 aperture is enhanced by machine-learning software, Google’s secret sauce to making your photos better. The phone design doesn’t stand out, either, and the battery life will be underwhelming for power users, but Google does pack in a 5.5-inch screen and dual front-facing speakers into a one-hand-friendly phone. It’s Google’s best phone in a smaller size. Update: Our Google Pixel 3 review has been updated with comparisons to the Samsung Galaxy S10 and details on price reductions. The Google Pixel 3 has the best smartphone camera you can buy today, and yet it comes in a one-hand-friendly size with a large enough screen to satisfy most people. You don’t need a big, pocket-busting phone to get great photos (this one has a 5.5-inch screen), nor do you need a dual-lens rear camera (it has a single lens on back), nor the fastest aperture on a phone (f/1.8 has been beaten by the LG and Samsung’s speedier f/1.5 aperture). Google proves that its 12.2MP photos are better because of machine-learning camera software and consistency. The Pixel 3 – and larger Pixel 3 XL – makes lugging around a compact camera or even an entry-level DSLR redundant. It also has features you can't get on professional cameras, unless you're constantly changing lenses. There are two front-facing 8MP cameras here, with the second lens designed for wide-angle selfies, enabling you to get groups photos without cutting people out of the picture. To this day, the Google Pixel 2 camera still amazes us, and the Pixel 3 builds off of that success with better photo detail and enhanced HDR. What’s more, the color-rich OLED screen is far superior due to its 18:9 aspect ratio. It’s not bezel-less by any means, but you do get more screen real estate than on the Pixel 2 – and keep the front-facing stereo speakers. It also avoids Pixel 3 XL’s awkward notch cut out that so many people hate on (rightly so). You’re not going to get everything in this small package. The battery falls short of bigger phones at a 2,915mAh capacity, offering all-day battery life with conservative use in our tests. Snapping 100 great photos in two hours was a real battery life drain. You’re also stuck with 64GB or 128GB – there’s no microSD card slot, and there’s no headphone jack. And, as much as we laud the behind-the-scenes camera software and Night Sight mode in our tests, the app doesn’t have all of Samsung's and LG's neat camera app tricks. The Google Pixel 3 is the ideal smartphone for anyone who cares about photo quality and isn’t satisfied with their phone’s picture-taking abilities today. It has the camera smarts and Android Pie-powered AI smarts of the Pixel 3 XL, without the awkward notch cut-out at the top. And, unlike the comparable, one-hand-friendly iPhone XS, it’s cheap – at least by 2018 and 2019 flagship standards. 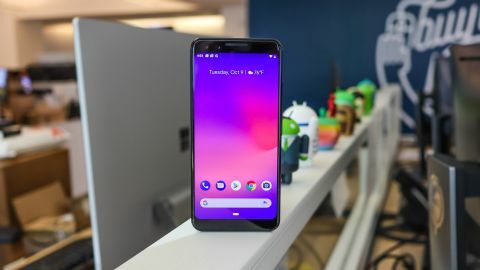 The Google Pixel 3 landed on October 18, 2018 in the US, and November 1, 2018 in the UK and Australia, and also subsequently came out in Canada, France, Germany, Japan, India, Ireland, Italy, Singapore, Spain, and Taiwan. The first pre-orders began right after the October 9 launch event. The Pixel 3 price is $799 (£739, AU$1,199) for the 64GB version, and $899 (£839, AU$1,349) for the 128GB version. We recommend more internal storage since you can’t upgrade later (remember, there’s no microSD card slot on this phone). It’s a price hike from the Google Pixel 2 (by $150), yet cheaper than an iPhone XS (by $200). You're paying for the more expansive screen and machine-learning camera, and the fact that almost all flagship smartphones cost more in 2019. However, some third-party stores have now knocked a little bit off the price - you can often find the Pixel 3 for around $50/£50 less than the RRP. The Pixel 3 retains Google's familiar two-tone design – the back has shiny glass at the top, while lower 80% has a matte finish. There's a more seamless transition between the two textures for a higher-quality look and feel, but overall its look hasn't changed dramatically. It easily fits in one hand, and, for the most part, you can operate it without resorting to using two hands. That's the best reason to choose the Pixel 3 over the Pixel 3 XL. It's screen size is big enough, yet the phone handfeel is rather manageable. Others will appreciate the fact that it doesn't have an ugly notch cut out at the top, a design choice deal breaker for many. Due to its late 2018 launch, the Pixel 3 also avoids the 'punch hole' camera design choice seen in the Honor View 20. It's trend that's sweeping 2019 smartphones, including the Samsung Galaxy S10. The Pixel 3 series looks similar to its predecessor, but it does in fact use different materials. The entire back is made of soft-touch glass using Corning Gorilla Glass 5. It's the same strengthened glass that protects the front screen, and it's all sandwiching an aluminum frame that has a hybrid coating – that's the only bit of metal you'll find on the outside. Sure, the all-glass design makes the Pixel 3 more susceptible to damage (though we have yet to find the scratches that others have reported), but glass also enables a better LTE connection and wireless charging. That's why we've seen a lack of aluminum-backed flagship phones in 2018. The Pixel 3 is the latest causality. Wireless charging is a new feature for the Pixel phones, and a welcome change now that Google has launched the Pixel Stand wireless charger alongside its new devices. We haven't had a wirelessly charging Google phone since the plastic Nexus 6. More rounded edges are everywhere on the Pixel 3. Its frame is less boxy than previous Google phones, a trend we've seen from the iPhone and and others. Gone is the harsher silver bevel around the frame and rear fingerprint sensor. It's like Google put the Pixel 2 through a smoothing machine, and we like the results. You'll still find dual front-facing speakers on the Google Pixel 3. No one else is really doing this anymore (except Razer with the Razer Phone 2), so it's nice to see in a flagship device. You'll also get Active Edge, which allows you to squeeze the sides of the phone to call up Google Assistant. We much prefer this squeeze mechanic as opposed to a dedicated AI button on the frame, like Samsung does with Bixby button (which we often confuse for the volume down button). The Pixel 3 comes with USB-C earbuds in the box, which means, no, there's no standard 3.5mm headphone jack (just like last year's Pixel 2) and without that microSD card slot, you're stuck with 64GB and 128GB storage configurations. The Pixel 3 color are rather muted, with 'Just Black' as our favorite of the trio. 'Clearly White' looks cheaper and 'Not Pink' isn't for everyone. Okay, it's the color you want if you're looking to stand out a bit, but we liked last year's unique Mint color more. You do get a fresh Mint color on the Clearly White Google Pixel 3 power button, however. The 5.5-inch OLED screen fits into modern times. It's big and expansive, and sits in a phone that's smaller than we had expected given the screen size rumors. The entire thing measures 145.6 x 68.2 x 7.9mm and weighs 148g. It's roughly the same size as the Pixel 2, which had a smaller 5-inch display. It's the grown up version of last year's phone. The Pixel 3 screen looks richer than last year's Pixel 2, too. The specs note that it has only a few more pixels per inch, but keep in mind the screen is much taller, so there are a lot more pixels spread across a half inch of extra screen. There's noticeably less bezel thanks to it's 18:9 aspect ratio rather than the dated 16:9 look. Last year's oversized bezel, we felt, was the biggest disappointment design-wise about the Pixel 2XL. The Google Pixel 3 fixes this issue. Oh, it still has bezel. There's no hiding the two front-facing cameras and speaker at the top and chin at the bottom. But it's the best we've seen from a phone with dual front-facing speakers and without a deep (some would say ugly) notch cut out.